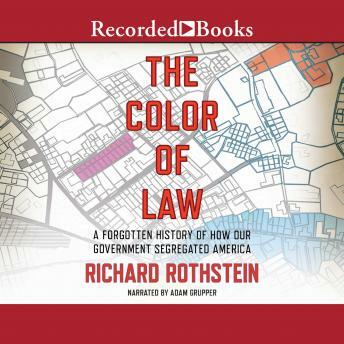 In this groundbreaking history of the modern American metropolis, Richard Rothstein, a leading authority on housing policy, explodes the myth that America's cities came to be racially divided through de facto segregation-that is, through individual prejudices, income differences, or the actions of private institutions like banks and real estate agencies. Rather, The Color of Law incontrovertibly makes clear that it was de jure segregation-the laws and policy decisions passed by local, state, and federal governments-that actually promoted the discriminatory patterns that continue to this day. Through extraordinary revelations and extensive research that Ta-Nehisi Coates has lauded as "brilliant" (The Atlantic), Rothstein comes to chronicle nothing less than an untold story that begins in the 1920s, showing how this process of de jure segregation began with explicit racial zoning, as millions of African Americans moved in a great historical migration from the south to the north. As Jane Jacobs established in her classic The Death and Life of Great American Cities, it was the deeply flawed urban planning of the 1950s that created many of the impoverished neighborhoods we know. Now, Rothstein expands our understanding of this history, showing how government policies led to the creation of officially segregated public housing and the demolition of previously integrated neighborhoods. While urban areas rapidly deteriorated, the great American suburbanization of the post-World War II years was spurred on by federal subsidies for builders on the condition that no homes be sold to African Americans. Finally, Rothstein shows how police and prosecutors brutally upheld these standards by supporting violent resistance to black families in white neighborhoods. The Fair Housing Act of 1968 prohibited future discrimination but did nothing to reverse residential patterns that had become deeply embedded. Yet recent outbursts of violence in cities like Baltimore, Ferguson, and Minneapolis show us precisely how the legacy of these earlier eras contributes to persistent racial unrest. "The American landscape will never look the same to readers of this important book" (Sherrilyn Ifill, president of the NAACP Legal Defense Fund), as Rothstein's invaluable examination shows that only by relearning this history can we finally pave the way for the nation to remedy its unconstitutional past. Well written and researched. It covers that erased part of American history not taught in schools. I was shocked by what I learned just after the first 5 chapters alone. If a White family wants to buy a house the bank offered them favorable loans at low interest. If a Black family with the same level of credit goes to buy a similar house the bank offered them sub-par loans at an inflated interest rate! Why? Segregation. These loans are packaged in a pay to own format. And while paying, since they don't fully own the house yet they do NOT get equity on the property during this 25 year period. The end result? The children of the blacks have no wealth to inherit! No headstart in life while their white peers have. In an effort to pay these inflated loans blacks would look for tenants which leads to overcrowding Not to mention that land taxes are higher in black segregated housing so they have less money to spend on the upkeep of their properties much less afford to move out. Thus a ghetto is formed.